Click here to find out what's new at Shoko's Natural Products! Hello! My name is Shoko Horikawa Moynihan. I am the owner of Shoko's Natural Products. Over 30 years ago I was suffering with extremely poor health. As a young woman and mother of two infant sons, I found myself completely exhausted day and night. I was diagnosed then with numerous severe conditions and was being regularly monitored by both the Fox Chase and Sloan-Kettering Cancer Centers in Philadelphia. I had no desire to leave this world and to leave my two boys without a mother. Something had to be done to improve my condition so for the past 30 years, I have been learning natural and nutritional methods of healing and protecting my body. Very early in my quest I discovered several truly remarkable whole food supplements. They are not vitamin or mineral supplements. They are whole food supplements, of which the integrity of life as a whole is not broken down. Out of these wonderful products it was chlorella from which I gained the most immediate and long lasting benefits*. Now at 65+ years old my sons are grown, and I am in the best of health. I believe that same health can be yours as well, and I will work with you to see you achieve your good health goals. As a result of taking chlorella, I started feeling energy and stamina in my body and clarity in my mind. Now over 30 years later I continue to enjoy excellent health in body, mind and spirit. In the early 1980s when I first learned what this green alga could do, nobody in the U.S.A. knew about it. It was known primarily among the Asian countries. Over the past 3 decades, more and more Americans have acquired the health benefits of chlorella and many chlorella makers have been introduced into the American market place. Unfortunately, however, many of these chlorella brands are not excellent quality products. Some have immature cells containing less quality nutrients, even dead cells. Some are cultivated indoors (without solar energy); some are treated with high heat and chemicals; some are cultivated in questionable water sources. At the end of 2003, we encountered a new strain of chlorella called Cryptomonadales ® crypto chlorella sorokiniana, which was my dream come true. This new strain, discovered in 1998 by the world's most expert chlorella microbiologists in Taiwan, contains not only the highest quality nutritional values including P.P.A.R.s Peroxisome Proliferator Activated Receptors and C.G.F. Chlorella Growth Factor but also it has a soft outer cell wall. That means Cryptomonadales does not require its cell wall to be broken, and it has naturally a 95% digestibility rate in 1 to 2 hours after you take it. Until now, the best digestible chlorella pyrenoidosa (after being processed to break the cell wall) had an 85% digestibility rate in 5 hours. 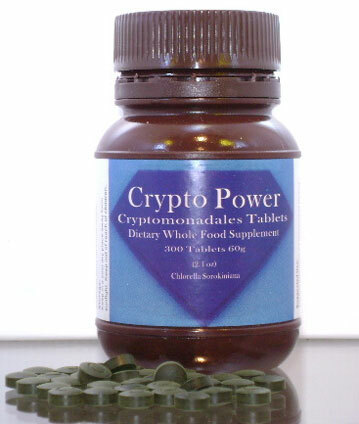 Cryptomonadales ® / Crypto™ Chlorella was renamed Crypto Power ™ Chlorella for the U.S.A. marketplace in May of 2006 (Trade Mark approved). 1-800-654-4394 "We value your privacy"
Please click here for our Special Sale List. The shipping costs listed on this website are for the USA only. If you are ordering from outside of the USA, you must be contacted concerning additional shipping charges and options for your order.